Autographed scarce as hen’s teeth large 8.25” x 11.75” fold over Festival Strings Lucerne concert program by the legendary Belgian violinist, Casino Bern, March 19, 1961. Grumiaux plays the Johann Sebastian Bach violin concerto in E major and the Mozart “Turkish” violin concerto in A major, k 219. Grumiaux (1921-1986) for whatever reason did not sign many autographs. When we see them, we grab them! He was first a piano wunderkind, gaining his first conservatory admittance at the age of 6 (Charleroi) where he studied with Fernand Quintet and then graduated to the Royal Conservatoire in Brussels where he studied violin with Alfred Dubois. He also studied violin and composition with Georges Enesco in Paris as a private student. After winning the Prix de Virtuosité from the Belgian Government in 1940 his career was assured. In 1949 he was appointed Professor of Violin at the Royal Conservatoire in Brussels. The violinist made his first appearances in North America in Boston in 1951. Characterized for his faithfulness to the composer’s intentions with an inate understanding of the music and technical brilliance; he dazzled the violin world for decades. The Belgian King Baudoin bestowed the title of Baron on him for his services to music. (The only other virtuoso to hold the title of Baron was Paganini.) 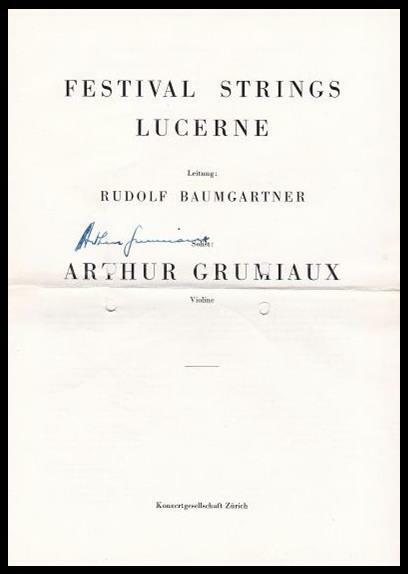 Grumiaux played on both Guarneri and Stradivarius violins. A large legacy of recordings in the Philips Catalog. Four punch holes due to previous storage, but the largest Grumiaux autograph we have seen. (His handwriting is usually miniscule.